There’s simply nothing more frustrating than a poor broadband connection. The internet now plays a pivotal role in both our personal and professional lives, allowing us to connect with friends, manage our finances and shop with popular retailers; all from the comfort of our own home. When that connection is suddenly taken away, many of us start to feel a little lost. Unfortunately, broadband issues are much more common than you’d perhaps first assume, with a recent Which? survey finding that over half of all UK households have experienced problems with their broadband at some point. In addition, research from Ofcom shows that a quarter of homes don’t have a connection fast enough to keep up with the demands of modern users, with over a million homes receiving speeds of under 10 Mbps and struggling to stream videos on Netflix. Since 89% of adults in the UK will access the internet at least once a week, it’s fair to say that many of us regularly rely on a strong Wi-Fi signal. After all, when the signal simply doesn’t reach far enough, you’ll inevitably suffer from painful loading times, reduced bandwidth and, worst of all, an irregular and unreliable connection. Whether you’re trying to get some work done or just streaming your favourite TV show, a poor signal can become downright maddening at times, particularly when you’re not entirely sure what’s causing the issue. However, most of the time this is a problem which stems directly from the router itself, as it’s simply incapable of distributing a strong signal to all areas of the house. Before ripping the cables free and chucking the entire thing out the window, you should try repositioning your router in a more central location, as this could widen the range and help it provide more consistent coverage. Alternatively, you might want to try updating the firmware or changing Wi-Fi channels, while sometimes it could just be a simple case of turning it off and on again (seriously). In the days of dial-up, we all learnt to hate that incessant buffering wheel. In the days of broadband, such slow internet speeds certainly aren’t as common, but they’re undoubtedly just as frustrating. After all, although you might have selected a package which advertises speeds of up to 25 Mbps, that doesn’t necessarily mean you’re guaranteed to enjoy such a fast connection. The speeds available in your home will depend entirely upon your location and chosen internet provider, as the coverage offered by ISPs will typically differ between areas. 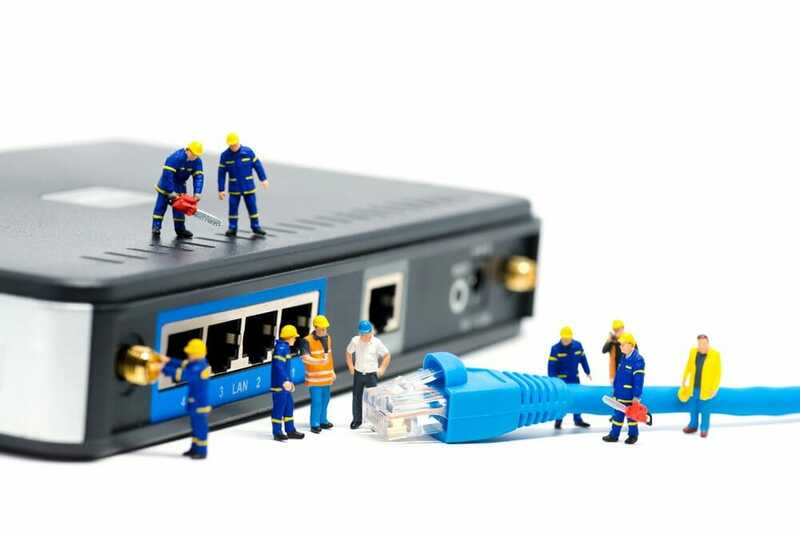 Standard ADSL connections are still the most common type of broadband in the UK, with the signal travelling from the telephone exchange through a network of copper wires. The further your home is from the exchange, the weaker the signal will be. When suffering from slow download speeds, you should try limiting the number of devices connecting to the internet at once, since this will inevitably clog up the bandwidth and bring back that dreaded buffering wheel. After running an internet speed test, you need to make sure your router is properly configured and that your device hasn’t been affected by any malware or viruses. In most instances, however, the best course of action is to look at upgrading to a super-fast fibre optic connection, since your distance from the exchange will no longer be a factor. According to the 2018 Which? survey, the majority of broadband problems are a result of poor service from providers, with 3 in 5 UK households reporting issues with unexpected price rises, inadequate speeds and poor customer service. Of all the providers involved in the survey, TalkTalk had the lowest approval rating of 40%, while Zen Internet came top of the pile with 85%. Although issues with your provider can undoubtedly cause a serious headache, this is actually the simplest problem to deal with. After all, there’s only one thing you can really do here: find a new internet provider. After attempting a few home remedies and then discussing the issue with your existing ISP, if you still remain dissatisfied with the service then you need to seriously consider switching providers and getting yourself a better deal. The speed and efficiency of your broadband is ultimately the responsibility of your service provider. If they can’t deliver a service you’re happy with, it’s time to go elsewhere and find a broadband connection you’re truly happy with.